You only need to spend two minutes on Google Play or Apple's AppStore to realise there are more online gambling apps that you'll ever be able to download. 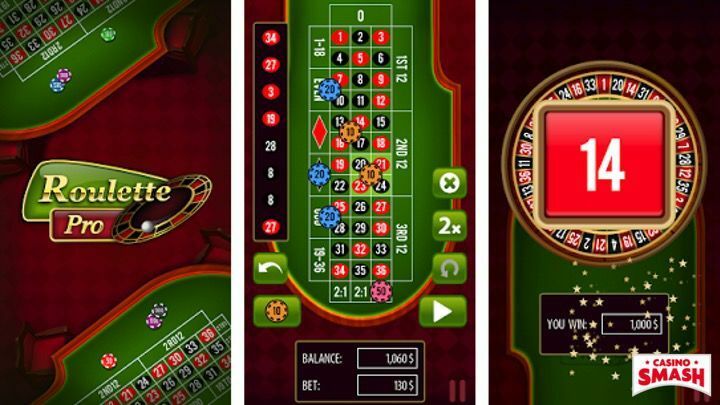 Each app store is full of free Casino apps for iOS and Android. That's why it is SO hard to find a good and free Casino application to play mobile Casino games on an iPhone or an Android device. I want to offer you a way out. Today, I want to help you to discover the best Casino apps for your Android, iPhone, and iPad - and I want you to download the ones you like. 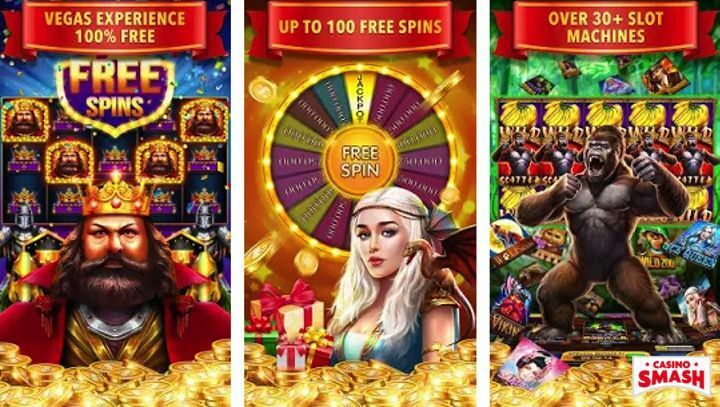 Mobile gaming should be an enjoyable mobile experience and if you know how to pick the right real money mobile Casinos, it can be a pretty exciting one too. Working on this article hasn't been a walk in the park. I had to test 100+ Slot machine game apps and cope with an impressive number of platform where the mobile experience is just terrible. But - now that I'm done with my research, you have a full list of the top 50 free Casino applications to download to your mobile phone in 2019. 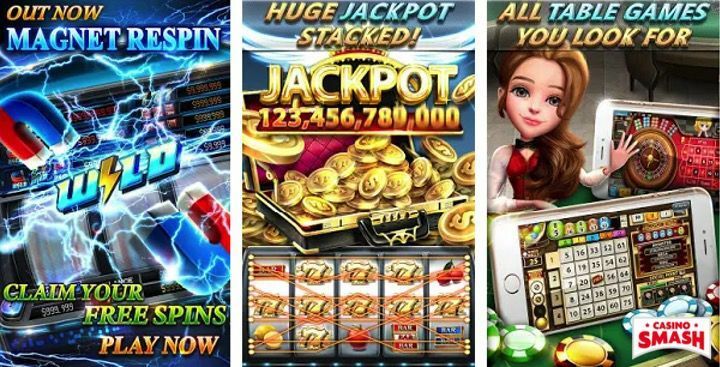 Some of these Casino apps let you play on real money mobile Casinos while other ones feature only play money games for a fun and risk-free online gambling experience. Naturally - I included numerous exclusive bonus promotions, too. 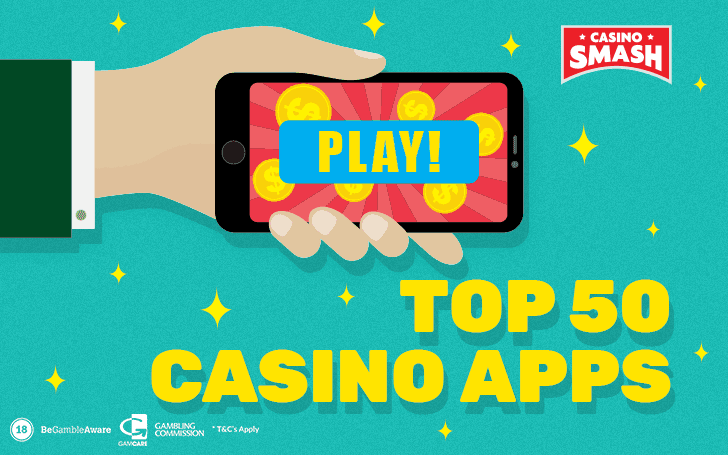 Whether you prefer Slots, Blackjack, Roulette, Poker, or Baccarat, this list of top mobile Casino apps has something for you. Let the download craze begin! 888Casino is one of the biggest names in the casino industry. And right now, you can have it on your iPhone, iPad, Android tablet or mobile phone. Play slots, blackjack, roulette, baccarat, poker, and other games for real money. Get immense bonuses with your first deposits - as well as a no deposit bonus upon sign up. 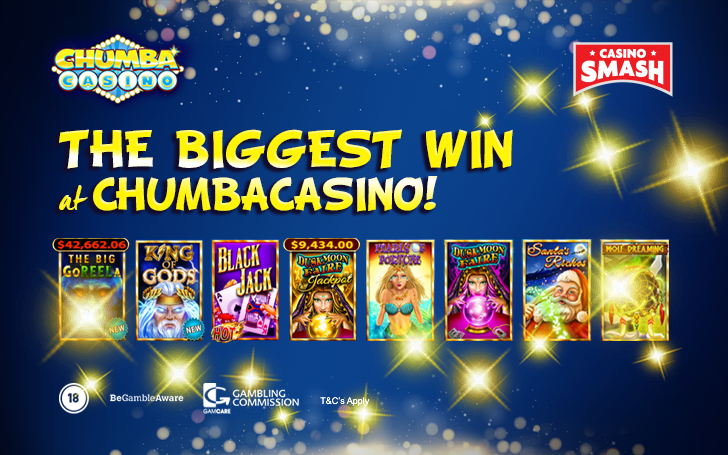 888Casino features fan-favourite games as Millionaire Genie, Clash of the Titans, Starburst, and more. The app is available in many languages including English, French, German, Italian, Japanese, Portuguese, Spanish, and Chinese. The LeoVegas iPhone Casino app has it all. Download it for an all-round betting experience. There are more than 500 Slot machines with excellent graphics to choose from. When it comes to the live casino section, LeoVegas mobile offers HD streaming and a huge number of tables. 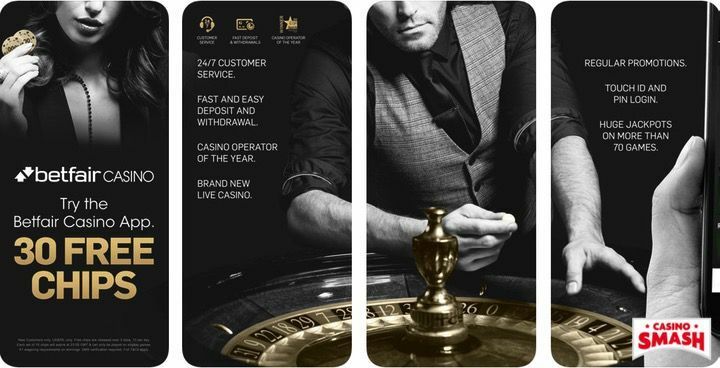 Deposits and withdrawals through the Leo Vegas iPhone and Android Casino app are super-quick as you can choose between a lot of popular depositing methods. There's a handy in-app feature to contact support if you need help and the mobile experience overall is just amazing. 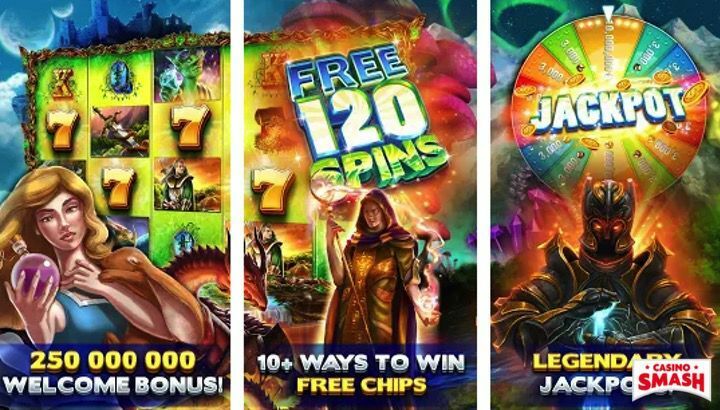 Register to get their grand welcome exclusive bonus of 100 free spins! Download BGO Casino app for a top online mobile experience and great mobile Casino games! In my experience, BGO has the most favorable bonus terms ever - and you can read this article to know more about it. Their mobile Casino app has all the best qualities of their online Casino, including a huge number of Slots and table games. Play anything you like - including the newest slots by NetEnt and Playtech, table games, card games, and a whole live dealer section. Pick your real money mobile game and enjoy! Betway Casino is one of the few true giants that operate in today's online gambling industry. Their bonuses are among the biggest ones you can find, and the selection of games is truly stunning. If you're up for some classic gaming, choose Betway's Roulette and Blackjack options - you'll find challenging tables where you'll need to play your best game to win. For something more relaxing, go straight to the mobile Slots section. And if you want to play with a nice-looking dealer, pick one of their live games. In a nutshell: download Betway Casino: Slots & Games to your iPhone, iPad, or Android device right now - you'll have plenty to enjoy! [B]download the [B]Casino.com[/B] application to your mobile. Casino.com brings you one of the highest-rated casino apps for Apple devices, boasting a rating of 4.9 stars out of 5. At Casino.com, you can enjoy more than 120 mobile Casino games - both for real money and as demo versions. These includes mobile Slots, Roulette, Blackjack, and Poker. Do keep in mind that this app doesn't offer any live dealer games for mobile or tablet. Get Casino.com for free if you enjoy virtual games - and you are in the market for some outstanding bonuses. 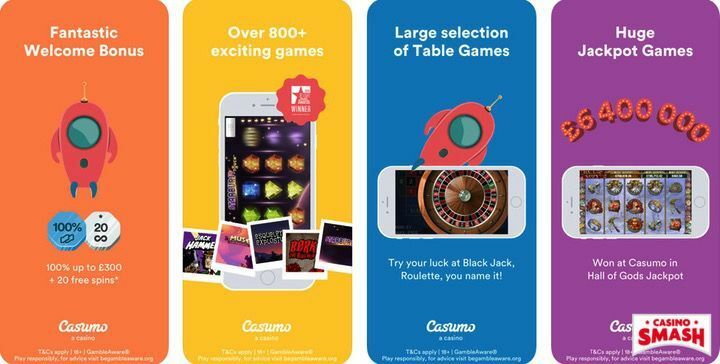 Take your iPhone, download Casumo Casino, and brace yourself - because you're in for an amazing ride. You can play more than 800 games on the Casumo mobile Casino app. For an app, this is an incredible number - especially since all the games are simply superb. 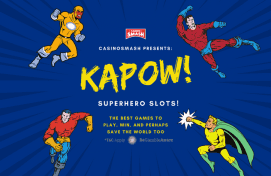 Casumo's real money games include Slots, Blackjack, Roulette, Baccarat, and live dealer table games too. There is also a demo mode to practice all Casino games for free. You can use it when want to have fun without a deposit. Those who decide to deposit get huge bonuses including free cash and free spins. Also, this Casino gives plenty of chances to win bonus money on a weekly basis to all their mobile and desktop users. You included. You can use the same account to play on Casumo Casino from iPhone, Android, and desktop. Download Casumo Casino to your device and let the fun begin. William Hill Vegas is a real money Casino app for iPhone, iPad, and Android that will blow your mind. Literally. This mobile Casino platform comes with a full package of essential games including jackpot Slots and table games. 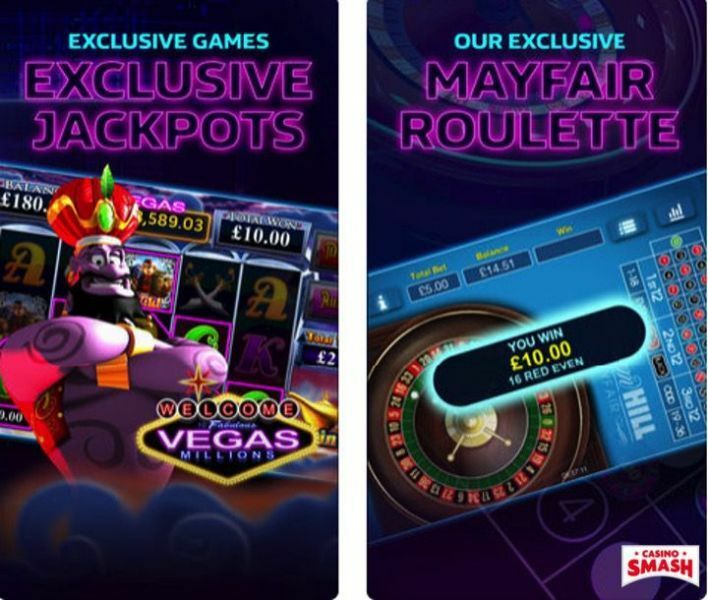 Their exclusive Mayfair roulette is a must! Make sure to get your hands on their Vegas Millions games - because if luck goes you way, you compete for exciting seven-figure jackpot prizes. Download the William Hill Vegas iPhone app completely for free, register a new account, and receive the welcome bonus that allows you to win more than you've ever imagined! The William Hill Live Casino mobile app by WHG Limited is a truly excellent addition to your mobile Casino app collection. It's like a real Casino - but you can carry it in your pocket! William Hill offers three different casino destinations: Mayfair, Macau, and Vegas. There are plenty of games to choose from, including Blackjack, Roulette, Baccarat, and Poker. Pick one of the 74 tables in the app and just get started! You can also have a lovely chat with your dealer when you play some of the best live dealer Casino games on the market. Betfair Casino and Roulette is a high-quality gambling and betting app for iPhone, iPad, and Android. 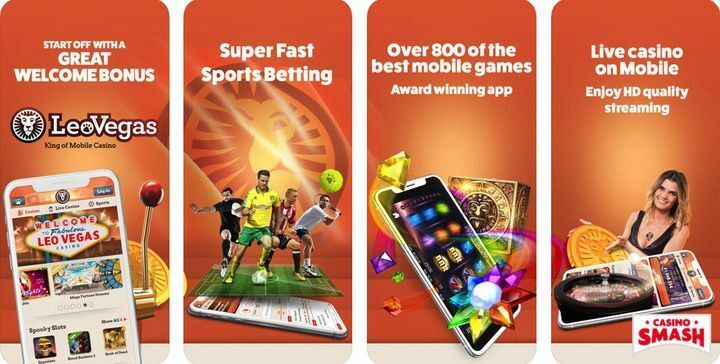 At Betfair, you can play mobile Casino games with real money all you want - the app won't let you run out of new and exciting games to try. You can also play demo versions with virtual cash, if you don't want to spend any of your hard-earned cash. Even better - register a new account today and get a good Roulette bonus to boost your bankroll. Check out their Slots, Blackjack, Roulette, and live Casino software - it features just about anything you could wish for. There's no better way to enjoy real money Casino games on a mobile in 2019 than to open the Bet365 Casino app. It's crazy how much action can be packed in one single application - like this tiny gambling jewel. Play the newest Slots, Roulette, Blackjack, Baccarat, and visit the lively live dealer section for their top quality games. Don't forget to try your luck at the popular Age of the Gods jackpot Slot - it's a great Slot by Playtech that looks amazing on mobile. Oh, and don't forget to grab Bet365 Casino's huge welcome bonus while you're there! Real money mobile gambling games on Android, iPhone, and iPad can be super exciting - especially when you play them on an top-quality site like Mr. Green Casino. Their gambling app includes everything you need, from classic Casino games and tournaments to sports betting. That's probably why Mr. Green won the title of "Online Gaming Operator of the Year" not long ago. People love their free Casino app and more and more players continue to download it every day. If you're interested in Slots, you can choose from 300 different games - and counting! For live casino fans, Mr. Green has prepared numerous tables of live Blackjack, live Roulette, live Baccarat, and live Texas Hold'em. Download Mr. Green to get their welcome bonus and activate their lucrative weekly promotions. Do you want to try something truly impressive? 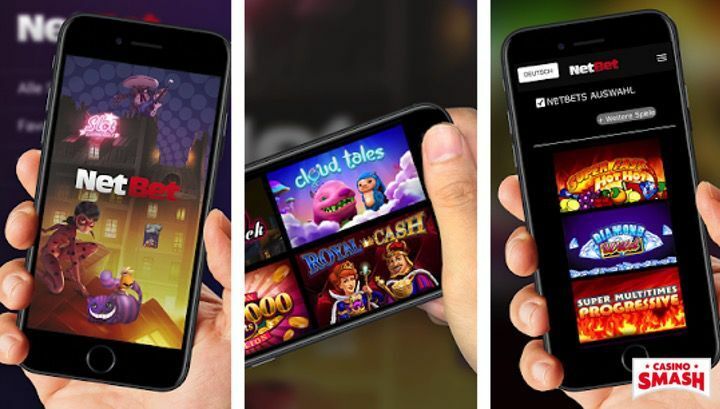 Open the Unibet Casino app on your mobile device to discover the top quality games every Casino fan must try at least once. Do you want to bring an authentic Vegas experience to your mobile? Download Unibet and tap on their live Casino mobile section. Do you crave for fun video Slots? Download Unibet and check out all the games on tap! You get are more than 250 mobile Casino games to keep you on the edge of your seat - whether you're at home, on a train, or at work. Betsafe Casino & Betting is also a good Casino and sports betting application for Apple devices and Android ones. You can use it to play Slots, Roulette, Blackjack, poker, and other games - all for real money and cash prizes. There are more than 900 casino games in this Casino app, so you can pick a new one every day and you still will not run out of options for at least three years! 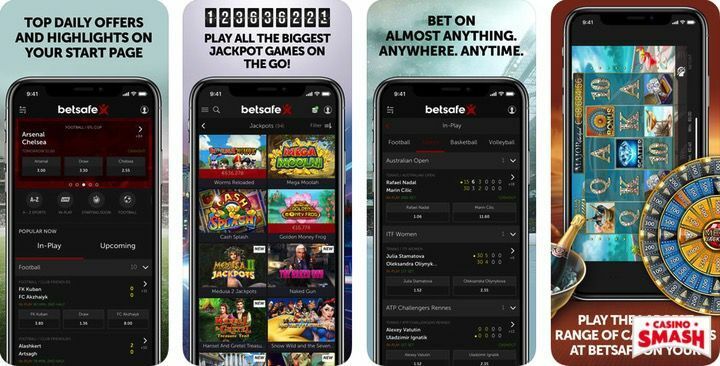 Download Betsafe Casino & Betting app to your iPhone, iPad, or Android device and enjoy their overwhelming welcome bonus on the 1st deposit. Slots Heaven by Mansion is the ultimate Slot machine iPhone app for real money. There are more than 170 different games (including progressive jackpots to win) and a terrific bonus to welcome all the new players. Create an account, make a deposit to play real money games, and get ready to play with 200 free spins and up to $400 in bonus money! This Casino app features also an exciting live dealer section where you can play Blackjack and other live games on the go. There, professional dealers who will keep you entertained for as long as you like. If you don't want to spend any money, no problem. 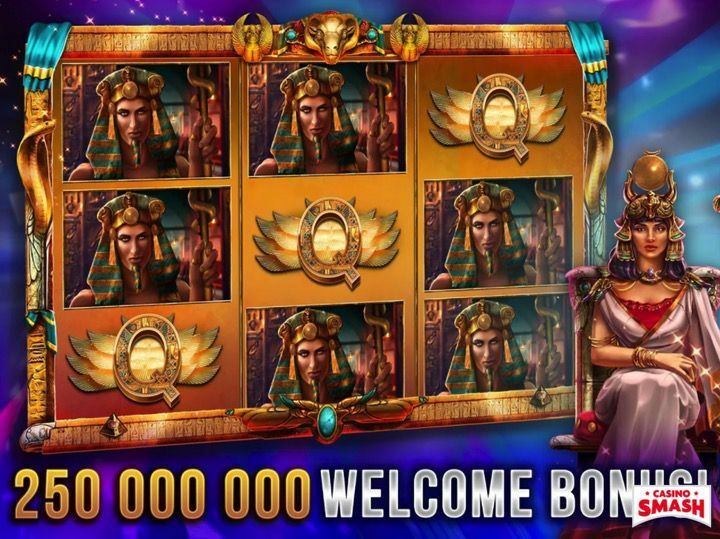 Slots Heaven offers demo versions to plat all their non-live casino games for free. This Casino guide was last updated in February 2019. If you have been to this article before, you might notice we no longer list mobile Casinos such as Paddy Power, Pala Casino, Jackpot City, and PokerStars Casino amongst others. We have also eliminated the part about playing Casino games from Windows phones as Microsoft admitted their Windows phones project is dead1. ...but will make you have a lot of fun! Below you see the top free Casino apps for mobile phones (or tablets) that run on Android and iOS. Make sure you download more than one to win hours of fun and exciting gaming experiences. Also, do not forget to claim your welcome bonus. 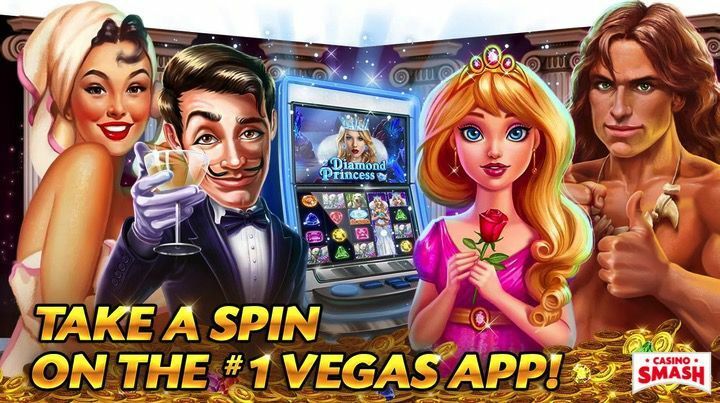 Each one of these 2019 Casino apps gives you a free, immediate bonus on signup! Slotomania is my favourite free Casino app. Hands down. The Slotomania app was the first one I installed on my Android phone when I decided to play mobile Slots - and that's when I fell in love with it. Developed by Playtika, Slotomania is one of the most popular Casino apps online. It is rated 4.4 stars on the Play Store and its Facebook page has 14,000,000 likes. It's iOS popularity is the same - millions of players have Slotomania on their iPhone or iPad and they use it to play free Casino games daily. Slotomania features a staggering number of slots - with more than 160 games on tap. To date, their catalog of games includes stupendous titles like Despicable Wolf, Magic Trixie, and Grand Phoenix. Download Slotomania to your mobile device now to experience hours of free fun! Chumba Casino is a one-of-a-kind gaming site that combines the best of all worlds. You can use this platform to play Slots, Blackjack, Roulette, and many other games in solo mode or challenge millions of other players in exciting tournaments. What makes this game truly special, is that it's a freeplay one with a caveat. Chumba features two in-game currencies (Gold Coins and $weeps) - and when you win enough of one of them, you can trade it for cash prizes. This is the only mobile gambling platform on this list that lets you do that so - you better keep that in mind! 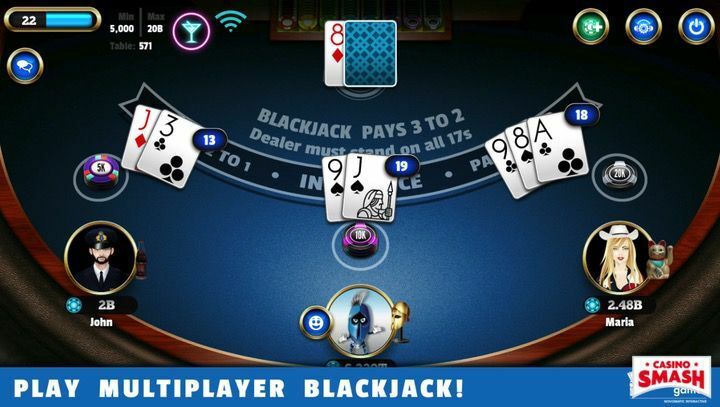 Blackjack 21: Blackjackist is one of the most popular blackjack apps for iPhone, or iPad, or Android. This is a perfect game to practice Blackjack online before you move to real money play. The app also offers other games like Slots and Roulette. WSOP Poker is the ultimate free Poker app for Android and iOS devices. Millions of people have so much fun on it every day - so why don't you? Even though it's completely free, you can use it to win a valuable prize: a real WSOP bracelet! The WSOP app allows you to compete and play online Poker with millions of other players worldwide. If you're serious about Poker, it would be a shame not to have this gem on your phone. Wizard of Oz: Casino Slots is not an all-around Casino app like the majority of the ones mentioned on this list. Instead, it's a Slots collection that will make you relive your beloved childhood movie. It goes like this: while you play Slots, you go through some scenes of the famous movie The Wizard of Oz and unlock new Slot machines along the way. If you like apps that offer full Casino experience - this one is not for you. However, if you're looking for some nostalgic fun - download the Wizard of Oz: Casino Slots to your iPhone or Android and enjoy a fantasy world where no real money is involved. Do you have the brain, courage, and heart to do this? Baccarat - Royal Online Casino is a free app for both iOS and the Apple Watch. YES! In 2019 there's a free Casino app for the Apple Watch! There are not that many Baccarat apps for iPhone, so this one is well-worth your attention if you like this game. You don't need any real money to enjoy the games on this app, as everything happens through virtual chips. And there are so much bonuses that you'll get plenty of them for free every time you open the app. However, you can also buy additional chips if you're up for some high-roller gameplay. Download Baccarat - Royal Online Casino if you're ready for some classic Punto Banco games. What can I say about HugeFun: Slot Machine Games that isn't already well embedded in its name? This app is fun - and it's huge. This is a free Casino game for iOS and Android where you play with virtual currency and you never need to spend a dime. Sure - you won't win anything but...you also will never risk to lose any money either! Upon registration, you receive 20,000,000 free coins as an exclusive bonus. This is more than enough to enjoy the all the games available for a long time. Download HugeFun Slots to your iPhone and start collecting the rewards. Casino Roulette: Roulettist is a great iOS and Android mobile Casino app for those who want some free Roulette entertainment and are not looking for ways to play for real money. 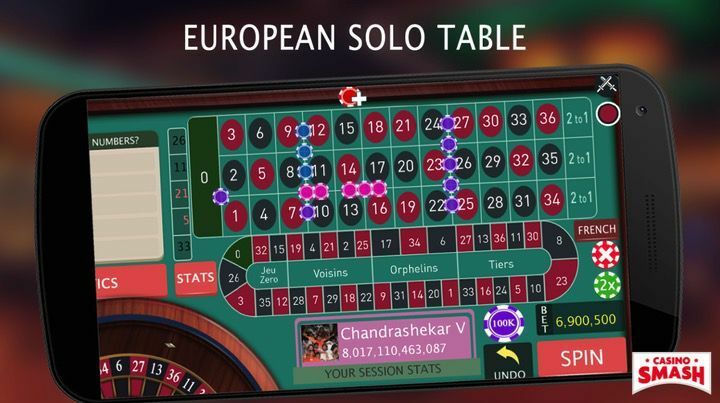 The app offers three different Roulette variations, including the French Roulette wheel, the American Roulette wheel, and the European Roulette wheel. There is even a tutorial demo mode where you can learn how to play the game of Roulette within minutes. Unless you don't prefer to read my guide to online Roulette, of course. The best thing - if you play every day, you will never run out of chips as the game's daily rewards are extremely generous. Casino Roulette: Roulettist is a must-have for every iPhone and Android Roulette player. Slots: Jackpot Party Casino is a simple Slot machine app for iPhone and Android with lots of free Casino games. The application features more than 110 exclusive Sslot machines with stunning graphics. All new players automatically get 6,000,000 coins for free after the first login. Participate in tournaments, grab daily bonuses, and win at progressive jackpots. Download Slots: Jackpot Party casino for some free fun. It's free, it's fun, and it's huge. 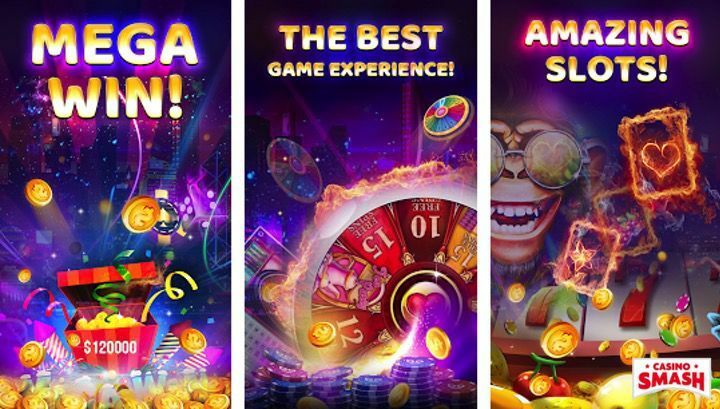 Welcome to Huuuge Casino, one of the very best free Casino apps for Android and iOS you can play in 2019. There's so much to do here! Play Slots, Roulette, Blackjack, Baccarat, Poker, and other games anywhere, anytime. Are you feeling lonely? Participate in tournaments with other players and prove your gambling skills! Huuuge Casino is the perfect app to play for fun. You don't need to pay anything to have a great time here. There is no real money involved unless you want to buy in-app products. Download Huuuge Casino app to your Android and grab all the free chips you can get your hands on! Now you can play Slots for free all you want with the help of this beautiful Casino app - Free Slots Casino - Adventures. Free Slots Casino - Adventures is the perfect app if you're broke since you don't need real money to play. Ever. Download this Android Casino app to play more than 50 fantastic games. Right now, every player gets a bonus of 250,000,000 coins - what more could you possibly need? Do you need some more Slots to play? Here you go! Download Casino Games - Slots to your Android phone ofr your pricey Apple device for some relaxing reel spinning - even if you are not online. Yes, this Android and iOS Casino app works offline! This online gaming app includes over 50 different Slot machines for every taste. Whether you prefer something modern or you are into classic Slots , Casino Games - Slots will satisfy your taste. The game sure does a lot to keep you entertained - there's not a single boring moment while Casino Games - Slots is open on your mobile. Fancy some jackpot Slots? Here's the perfect app for you. Download the Full House Casino mobile application to your Android device or add it to your iOS collection of free online gaming apps. 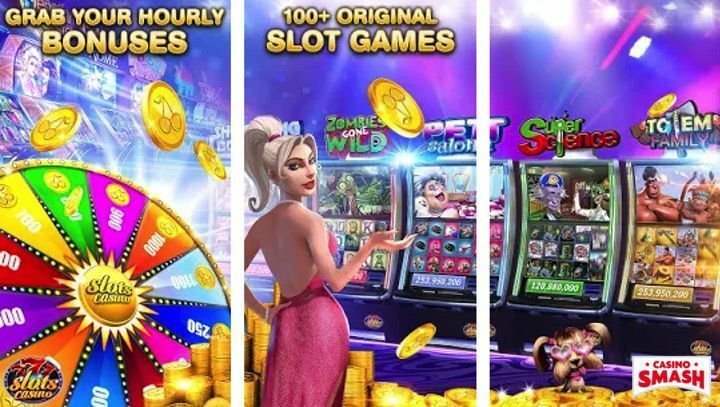 Once on this app you can play not only Slots, but also a huge number of other Casino games like Blackjack, Roulette, Baccarat, Bingo, Casino Hold'em, Sic Bo, and Video Poker. It feels just like a real Casino like Jackpot City, Betfair Casino, or Paddy Power Casino. There's only one difference - you don't need any real money to have a good time here. This iOS and Android mobile Casino app is entirely free. Full House Casino: Lucky Jackpot Slots Poker App is one of the most highly rated apps in the Google Play Store, boasting an impressive five-star rating. If you think this Casino app is only about plain old slots, think again. 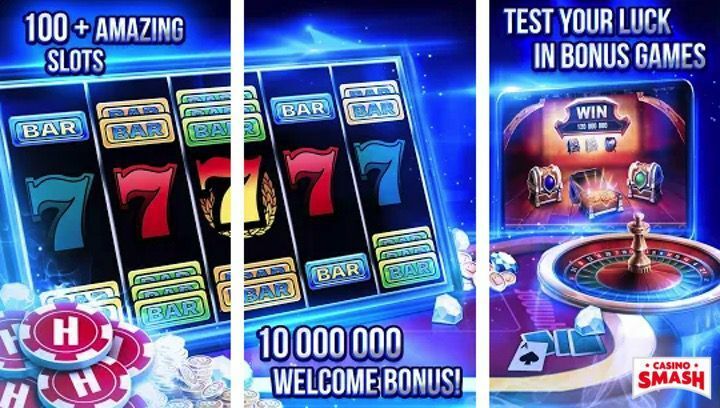 Sure, Slots™ is booming with Slot games, but it has so many interesting exclusive bonus features that you'll want to open it again and again. All you need to do is to install this Casino app on your mobile device, and *BOOM* - you have 600,000 free coins to spend! But that's not it - as this Casino gives you lots of opportunities to get even more coins! Now, have some fun - with no real money involved. Ceasar's Slots has conquered many hearts so far. It's completely free, it gives you lots of free coins, and it features unique slots for Android and iOS. You don't need any money to play at Ceasar's Slots. You use virtual coins - which you get for free! The welcome bonus alone is worth 40,000 coins. It is a remarkable addition to anyone's mobile gambling collection. Play, earn rewards and upgrade your player status. With each tier, the gameplay becomes more and more exciting. Try it now! Online Slots? For free? I'm in! With a welcome offer of 250,000 free coins, you won't run out of fun anytime soon if you download this free app. If you do, just spin the Bonus Wheel once every four hours to grab some more free coins to play from Android or iPhone. 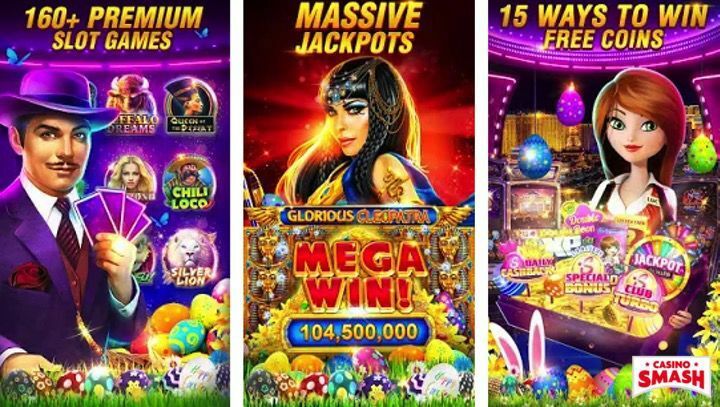 You don't need any cash to download and play 777 Slots on your Android or Apple mobile phone as there is no real gambling involved. So - play, invite friends and feel the Vegas spirit. Blackjack 21 by AbZorba is the Casino app you need when you're in the mood for some exciting online Blackjack games. It's the most downloaded Blackjack app for Android on the Play Store, and it's 100 percent free. The game's design will bring you to a real Vegas-style Blackjack table. No need to leave your home for some fun! Download Blackjack 21 to your Android mobile device and practice your best blackjack strategy for free. It's time to spin the Roulette wheel - with the help of Roulette Royale by Mywavia Studios. A glamorous free Casino app packed with exciting action. Practice your betting strategies for both European Roulette and American Roulette. Open the application and choose your game to get started. Also, everyone gets free bonus chips - immediately after the installation. One download - more than 45 games. This is possible with Hot Casino - Vegas Slots Games. This mobile Casino app will transform your mobile phone into a real Vegas and Macau-style Casino completely for free. The game does not involve real money and gives generous bonuses upon installation, leveling up, and daily task completion. Additionally, you get to spin the bonus Roulette for extra coins every four hours. You can choose to play any game you want - there's nothing to unlock. Also, this Casino adds new slots every month, so you'll never get bored. Get Hot Casino now and discover a whole new world of Slot machines. Real life rewards? Shaquille O'Neal? Free gameplay? WOW! If you are in it for some good fun, download myVegas Blackjack 21, a free Android and iOS Blackjack app that gives out real rewards. With this online gaming app, you can trade your loyalty points for restaurant coupons, Las Vegas club invitations, free travels, and more. The Blackjack games featured in this app are also something to look forward to. 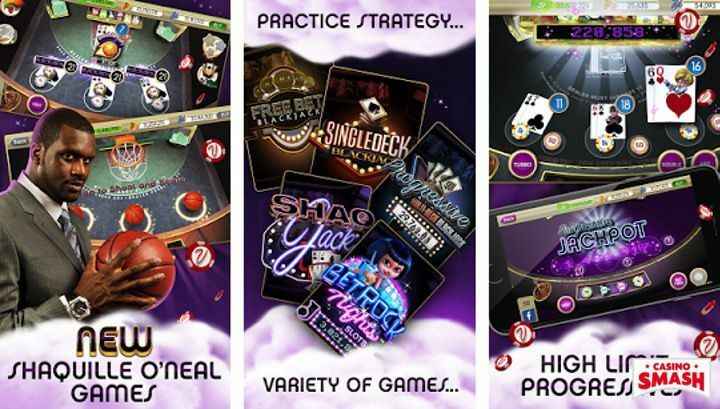 This is the only app that features unique Shaquille O'Neal Blackjack tables called ShaqJack! There's not a single reason to ignore this gem of an app. Download it now and start collecting your bonus points. 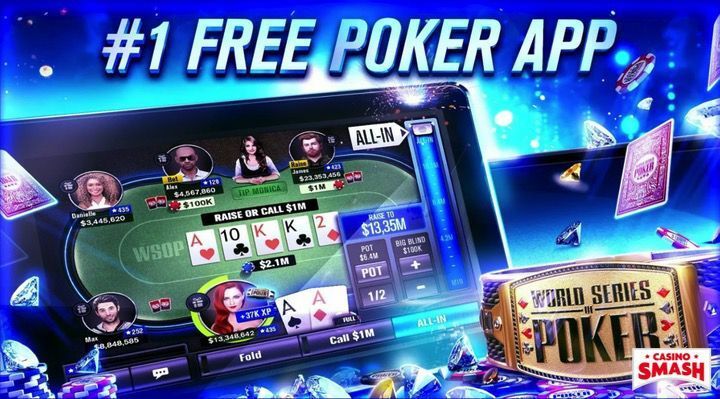 Live Holdem Pro Poker is the perfect Android app for Poker lovers. Oh - I almost forgot: iPhone and iPad users live it too! Live Hold'Em Poker boasts a 4.6-star rating with votes from more than one million players. There are two modes to play: live and online. You can either play virtual Texas Hold'em games or participate in exciting online tournaments. And all of this is for free - since you don't need real money to play. Download Live Holdem Pro Poker to your mobile phone and start practicing your best strategies. Casino Frenzy is a free iOS and Android app that offers a variety of Slots and Poker games. This is probably the best choice for Android users who want to play together with their friends. Casino Frenzy features an exciting and fun multiplayer mode, a feature that not many iPhone and Android Casino apps offer today. ou can collect free coins all the time and play as much as you want risk-free. Are you tired of Slots, Blackjack, and Roulette games? Are you looking for some new mobile games to try? Have a look at Bingo Pop then! Download this mobile app to your Android device, to your iPhone and to your iPad, and practice playing Bingo - for free. With more than 100 levels to unlock and exciting power-ups to use, this app promises never-ending fun. With Bingo Pop, you can play online and offline Casino games, too. 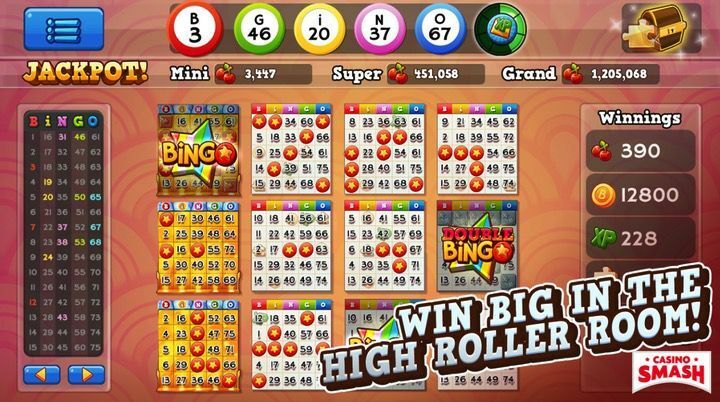 Enter the exciting Bingo tournaments and grind it hard to bring your name at the top of each leaderboard. This is the official Android application of NetBet Casino. This Casino features a wide range of free mobile gambling games, meaning it's not just a collection of online Slots. Download NetBet to turn your mobile phone into a gambling powerhouse. Play sSlots, Roulette, and card games like Blackjack and Baccarat on-the-go. The best part is that you don't need to spend a penny for so much entertainment. This is a free app with no real money gambling involved. You might be familiar with the desktop counterpart of Spin Palace Casino - as this is one of the oldest Casino sites in the world. 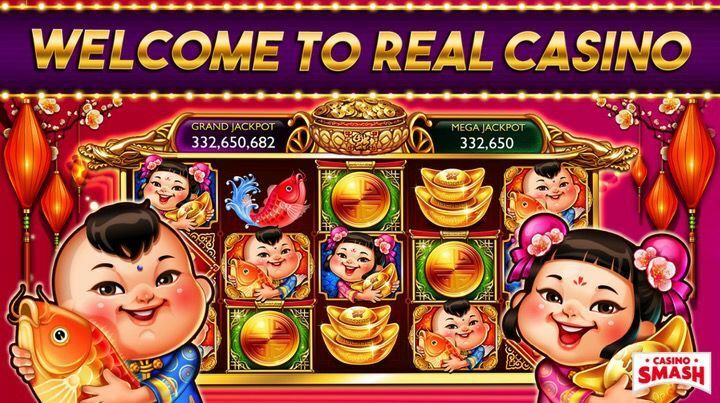 While the desktop and HTML5 version of the site deals with real money Casino games, their Android application is all about risk-free gambling and entertainment. You don't need to make any deposits to play the best Slots in the world if you pick this app. Simply download Spin Palace Casino to your mobile and enjoy Slots, Blackjack, Roulette, and Poker games. This is truly one of the best free Android casino apps of 2019. In case you are new to gambling, do know that Jackpot City Casino is one of the most well-known Casino brands online. 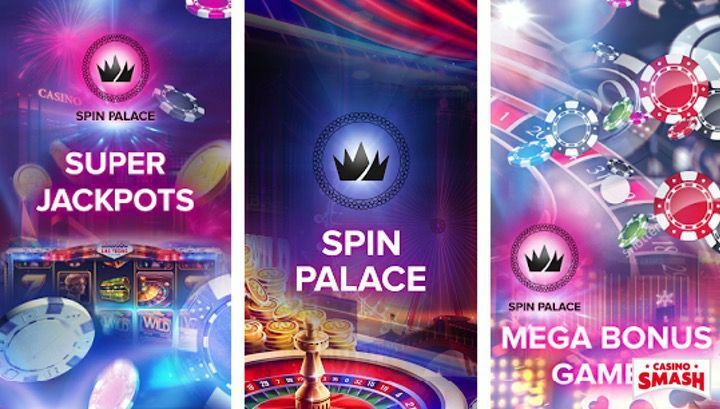 Like Spin Palace, they run a free Android app alongside their traditional real money online gambling platform. Yes, their mobile application doesn't involve real money operations. Play Slots, Blackjack, Roulette, Poker, and other virtual Casino games on your mobile - all for free. Blackjack - 21 Casino Card Game is just what you need to perfect your Blackjack strategy skills. This is a free Android mobile Casino app that you can download directly from Google Play. It's free because Blackjack players don't need to spend money to have a great time. This game has exceptionally nice graphics, so download it to your mobile if you want to feel like at a Vegas Casino. Full House Casino is a gambling simulation app for Android and iOS devices. 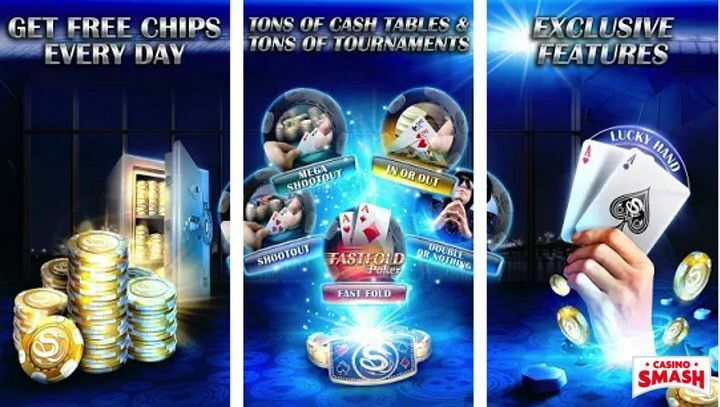 This app features a large number of Slots, great bonuses, and exciting multi-player tournaments. 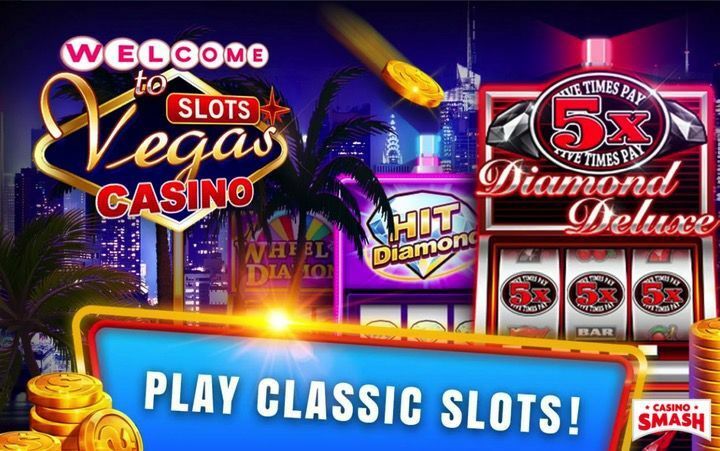 In total, players can choose from over 50 different Slot machines that include popular Casino games like Wheel of Jackpot, Africa, and King Kong. Full House Casino counts more than 5 million downloads and it is one of the most popular Android gambling apps. 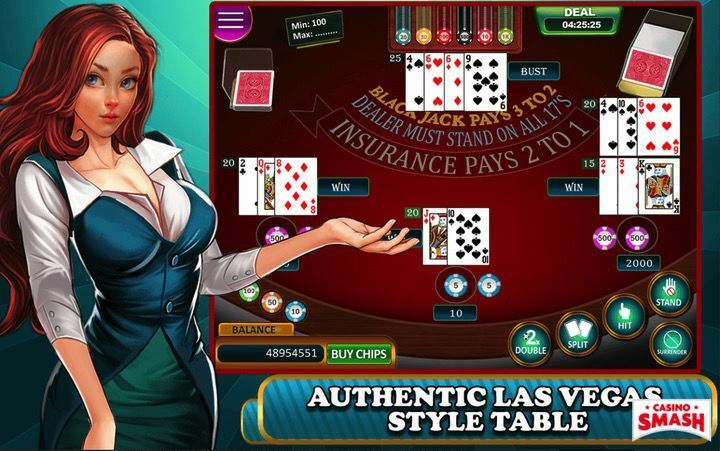 Blackjack 21 Pro is the most downloaded Blackjack application for Android and iOS devices. This app features everything you need when you're in the mood to show the dealer what you are capable of. This free Casino application offers in-app purchases, but it doesn't involve real-money gambling. Blackjack 21 Pro is probably the most generous Casino application of its kind as you can get free chips to continue playing for free - every hour! There's also a live chat function to communicate with fellow players from just about anywhere in the world. Download Blackjack 21 Pro to your Android phone and enjoy not only Blackjack games, but also some variants of Roulette, Baccarat, and Poker. It's baccarat, it's online, and it's 3D. All you can ask for in a free Baccarat app for Android / iOS is on this one. Download it now to get 10,000 free chips and play your first 3D Punto Banco hands. If you haven't played this exciting card game before, this is the perfect Casino app to start. The best players get generous rewards here - become one of them! 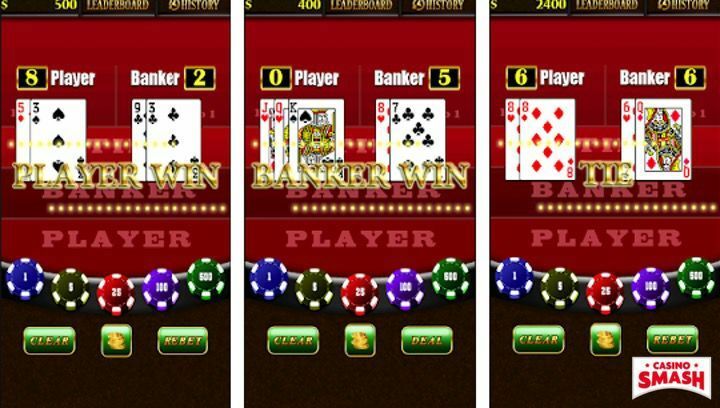 In case you need even more options - here's another Baccarat app for Android. Download Vegas Baccarat Casino Game for free if you're craving for some free-to-play card gambling games. The bets vary from $1 to $500 but - don't worry! All the actions happens with play money - so you don't risk anything! You don't even need to make in-app purchases because there are plenty of ways to earn free chips. The best one? Bring some of your Facebook friend to the app and they will shower you with bonuses. Roulette Pro - Vegas Casino is an Android and iOS gaming app that simulates the sights and sounds of a real Roulette wheel. Whether you prefer the Martingale or the Paroli strategy, you can download this free app to train your skills and become a better Roulette player. You can play this mobile Casino game offline too, so there's no need for Internet connection. Play any time of the day, anywhere you want! Well, that was a long ride. You just went through our list of the best mobile Casino apps of 2019. Think of it as a guide for when you run out of games to play. All the download links lead directly to the official apps, so you have direct access years and years of mobile gambling fun. Also, we would love to hear what you think! Do you know any other mobile casino applications that I should include on this page? Send us a message via this contact page and let us know what your thoughts are!